Where – Hood Canal, Washington (the only glacier carved fjord in the continental United States). Each one of these deeply cupped oysters is bursting with the rich and intense cucumber-like flavor that the Canal is renowned for around the world! This is an exclusive oysters to Santa Monica Seafood… Averaging 3 – 4 inches long, Crystal Point Oysters are available in 120 ct. units. Highlight the Pacific Northwest origin of these oysters on your menu! And, since we’re the only company in town carrying them you can be sure your customers are enjoying a one-of-a-kind oyster. 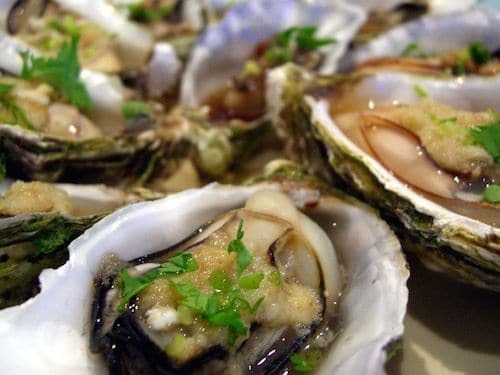 Did you know oysters are full of Zinc? Some think that’s one reason they are considered to be an aphrodisiac. Don’t forget to add plenty of lemons, Tabasco and Santa Monica Seafood Cocktail Sauce to your oyster display!